Begun and held at the City of Washington, on Monday, the nineteenth day of May, one thousand nine hundred and nineteen. 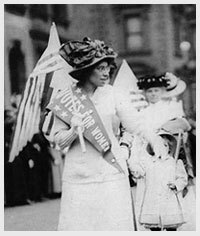 Proposing an amendment to the Constitution extending the right of suffrage to women. Resolved by the Senate and House of Representatives of the United States of America in Congress assembled (two-thirds of each House concurring therein), That the following article is proposed as an amendment to the Constitution, which shall be valid to all intents and purposes as part of the Constitution when ratified by the legislatures of three-fourths of the several States.